MSI GV62 8RD-200, an affordable gaming laptop but deliver excellent performance in any PC game you throw at it. Experience incredible power boosted by the coolest tech. Powered by The newest 8th Generation Intel Core i5-8300H processor with 8GB DDR4 RAM, and NVIDIA GeForce GTX 1050 Ti (4GB GDDR5) dedicated graphics. It also comes with 1TB (5400RPM) HDD with the Intel Optane memory, a smart memory technology that accelerates computers’ responsiveness. That means you can load game faster, open large files quicker, and also speed up every tasks as well. So, MSI GV62 8RD-200 is powerful enough to handle various AAA titles that need high requirements. MSI GV62 8RD-200 measures at 15.07 x 10.23 x 1.16 inches and weighs 4.8 lbs., which is relatively light for a budget gaming laptop. The laptop sports a black matte finished exterior, and MSI’s brushed tactical cover designs will both maintain lightness and preserve that gaming feel. The chassis is almost a photocopy of other entry-level gaming notebooks from MSI. The case seems like the biggest cost-saving measure of the device. It’s going to leave some fingerprints and smudges behind but they can be wiped away with some effort. The lid, on the other hand, is rigid enough, if not impressively so. Like with most MSI gaming machines, the SteelSeries keyboard is excellent for gamers’ needs. Featuring crimson red edge glow keys with enhanced responsive and tactile feedback, optimum WASD zone and support of multi-key inputs are all for gamers to gain full command over gaming missions. We believe that the MSI’s keyboards are some of the best on gaming laptops, and that continues even in their budget lines. The backlight gets fairly bright but is limited to a red color. MSI GV62 8RD-200 comes with 15.6 inches Full HD eDP IPS-Level with a 120 Hz refresh rate. Color accuracy is fairly good as we can expect for a budget gaming device. Viewing angles are also fairly good and there is virtually no backlight bleed at any brightness level. 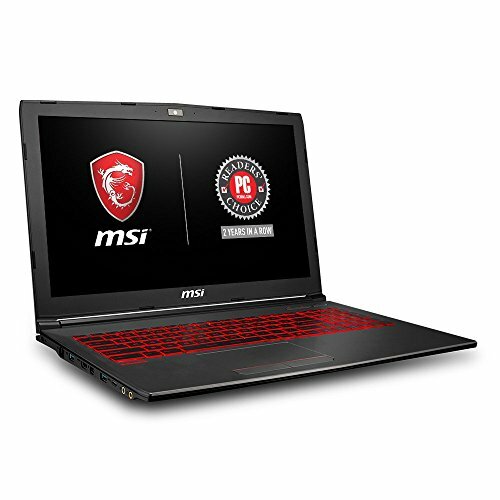 So, the purpose of the MSI GV62 8RD-200 is to offer a cheaper gaming laptop. In that regard, colors are acceptable and won’t be distracting during gameplay. But you can find others entry-level gaming laptops that offer much better color reproduction like Acer’s Predator Helios 300, for example. Based on the specs, the MSI GV62 8RD-200 is decidedly “middle class.” While not as powerful as the Core i7-8750H, the Intel’s Coffee Lake CPU, Core i5-8300H gets the job done and should be more than adequate for most users’ needs. The CPU and dedicated graphics are also well-suited to gaming at Full HD. The i5-8300H is Coffee Lake’s mid-tier 45 W CPU, now boasts Hyperthreading, increasing multi-threaded performance by about 50% over the i5-7300HQ. According to the Cinebench R15, the 8300H scores about 10% better than even last generation’s i7-7700HQ in multi-core workloads. That means, the i5-8300H should be more than adequate for gaming. With the new Intel Optane memory technology provides SSD-like responsiveness, gives you the power to boot, access storage, launch, and get things done at maximum speed. It also delivers better overall system responsiveness compared to adding additional RAM. Install all your games on a large 1TB capacity HDD and play them at SSD-like speed so you can play a new game without clearing up the fast storage space. The all-new Nahimic3 technology allows it to deliver enhanced 3D surround sound for an immersive gaming experience. In addition, the laptop is upgradeable by adding extra RAM, and it supports up to 32GB RAM for higher performance. If you looking for affordable gaming laptop boosted by the coolest tech, the MSI GV62 8RD-200 gaming laptop offers the best performance at their price and are suitable for most users’ needs. If you looking for affordable gaming laptop boosted by the coolest tech, the MSI GV62 8RD-200 gaming laptop offers the best performance at their price and are suitable for most users' needs. Why Amazon Fire HD 10 Kids Edition Is The Best Tablet For Kids?